There were TWO(2) STREETLEGAL MC12 Corsa straight from factory! The MC12 Corsa is NOT A RACE CAR it is a factory supported trackday toy for selected customers...the MC 12 race car was the MC 12 GT1. Yes 2 units are road legal, the others not. 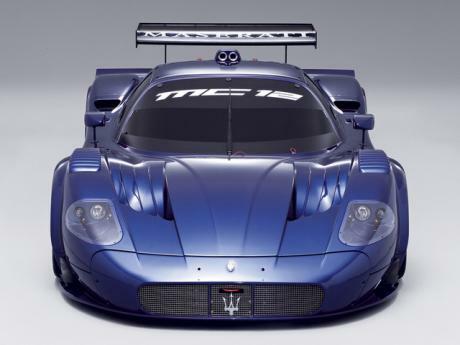 two of the mc12 corsa cars are road legal. It´s not legal road car but is much more faster than the GT2 RS and gumpert apollo. This is actually the only 1 competitor for Porsche GT2 RS and Gumpert Speed. Is this an Official offering by Maserati? if not, it should be deleted no? and that 0-200kmh surely cannot be true, even with its power/weight/tyres/transmission. Is there any admin on this seite and finaly amend incorrect acceleration from 0-200 km/h? Does anyone checking data? Even Veron is unable to do it so fast!!! Obiviously 6,4 is acceleration to 160 km/h from standstill .I only wonder if I'll write that admin is ****** or jerk he also don't pay attention on that. Is this even provided BY Maserati? like a regular car, cause if not, its just a Tuned Race car that be Legalized. there are at least two street legal... this black one and a orange one that was prepared by Edo Competiton for street use... they have done it for a guy in Canada.. The only one in the world thats legal??? How do you know?? I think this is a Tuned MC12, im not sure, i couldnt care less, im just saying. 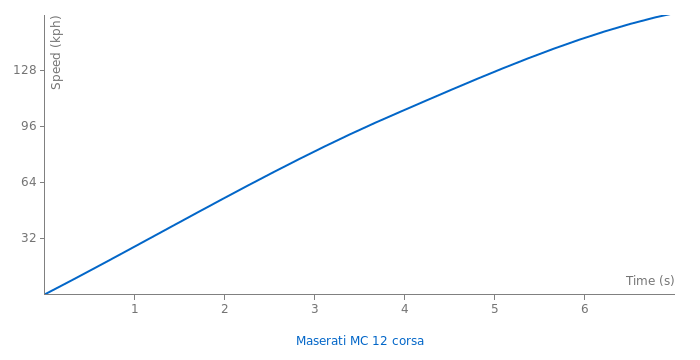 I think the MC12 Corsa is a different model than the standard MC12 that MT tested. No, MT does not do 0-62mph, they do 0-60mph, and there test was weak. My '57 Chevy drag car did 0-60 mph in 1.68 seconds, but it took 4.4 more seconds to hit the eighth mile (5.72 at 122 mph)I would guess that the 0-100 km/h is wrong because the 0-200 km/h would indicate around a mid 9 second quarter mile, which wouldn't be unreasonable for the HP and weight listed. dude, there's no way that it takes 3 sec in 100-200, is physically impossible, If we did a graph of acceleration in a car you would realize how impossible it is. that as time passes, more accelerated? no way!